This gorgeous bonsai has a beautiful canopy of large glossy green foliage. A breathtakingly beautiful and commanding bonsai tree. Set in a natural brown ceramic bonsai pot with fluted edges and matching tray which contrasts with the leaves, this bonsai is truly gorgeous. Highly recommended for beginners, the Ficus indoor bonsai tree is easy to care for. Stunning aerial roots and a powerful trunk give this Ficus bonsai a lot of character. Exquisite, Premium Fig bonsai (Ficus retusa). This bonsai tree combines both low maintenance with bright foliage and unique character. The tree has a distinctive trunk, with multiple splits, making it a perfect feature for homes and offices. The Ficus Bonsai has wonderful glossy green leaves and rejuvenates itself very quickly following pruning. The Ficus is said to represent health and love and is ideal for darker rooms. 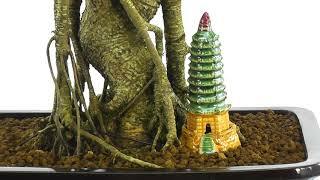 Additionally, this bonsai is resistant to most pests. It comes in a mahogany ceramic pot, with matching drip tray. The glazed ornamental temple is included and adds an additional feature and great perspective. Beautiful character trunk with lovely taper and aerial root. The foliage contrasts wonderfully with the midnight blue ceramic pot. * The pot size is 30 x 26 cm. * Mahogany brown ceramic glazed bonsai pot.